Tonight we are going to try to get back into some sort of normal bedtime routine in preparation for school on Tuesday. I have been chatting to my boys (7 & almost 11) to remind them how our morning routine works on school days and most importantly the time we are expected to head out the door each day. 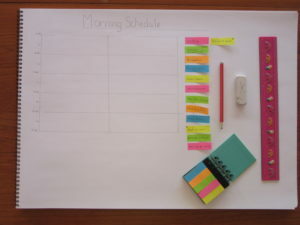 I use a couple of schedule sorters to work out morning routines, including the attached “post-it note” version. Sorting out the morning routine usually flows into sorting out the evening routine as one impacts on the other (when do the kids have their shower, where do they put their school shoes each night?). Good luck to everyone heading back to school this week! Need a hand with your morning or evening routine? Have a look at my Time Management Services or Contact me today for a chat about your school or work routine. Julie Cliff, Founder and Professional Organiser, Space and Time.